Information in this area will follow shortly. The Task Log is Priority‘s main tool for planning and tracking marketing assignments. It enables you to record tasks for all users in the system, including those involving specific customers or vendors. Appointments are then opened automatically in the user’s Calendar. The system can send the user a reminder regarding an approaching task and its start time. In addition, the system automatically opens a task (and appointment) whenever a user is scheduled for a sales order, service call, assembly or project, or when an e-mail message is sent to or received from a customer or vendor. Priority supports the creation in batch of routine tasks that repeat themselves at weekly or monthly intervals, such as staff meetings or site inspections. All tasks that contain a start and end time appear in the Calendar of the user scheduled for the task. You can view all pending tasks per day and per week. The system will remind you in advance of an upcoming task, according to the warning interval defined in the Task Log. In order to further expedite your marketing activities, the Marketing and Sales module smoothly interfaces with the Office Management module and Priority‘s integrative mail utility. Your personal Calendar and company contacts are all accessible for viewing and revising from within the Customer Relations Management module, thus enabling you to coordinate your personal tasks with customer-related activities. To assist users in the maintenance of their tasks, a new icon on the Main Tool Bar opens the To Do List (Office Management module), in which you can retrieve tasks, documents, orders and the like for which you are the assigned user, or the user in charge of follow-up. This form displays all the active tasks and documents assigned to all users in the system. Priority features a Marketing Campaigns module based on sales opportunities. Marketing leads are received from a variety of sources, including contact data imported from Outlook. You can then open a record in the Sales Opportunities form for each lead, and link it to a specific marketing campaign. Tasks can then be opened in batch for all leads involved in the campaign. Each stage in the cultivation of a lead corresponds to a sales opportunity status, and each status is assigned a progressive percentage representing the probability of closing the deal – as an opportunity moves from one status to another, the odds of closure increase, as does its estimated value. How does this work? Each sales opportunity is linked to activities (e.g., tasks, price quotations, sales orders) whose success or failure determine the opportunity’s status and estimated monetary value. 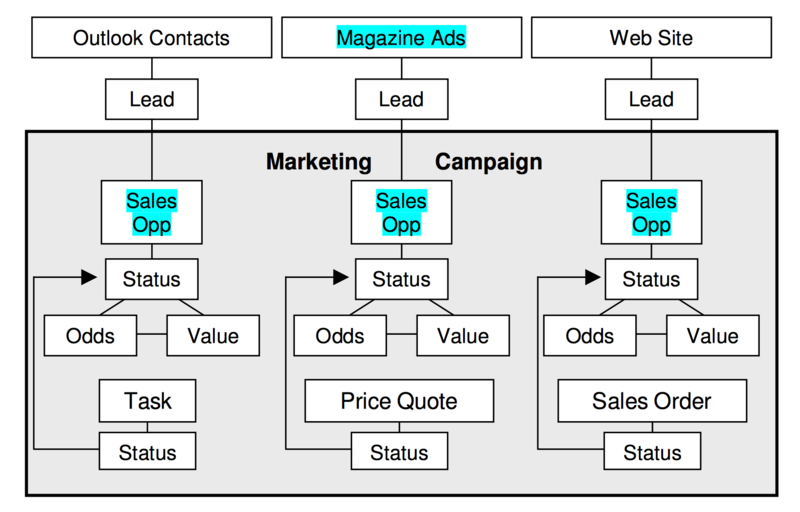 You can use the BPM Flow Chart – Sales Opps to define a series of statuses for sales opportunities (e.g., Initial Contact, Open Price Quote, Authorized Price Quote). You can then enter the statuses form for each activity (e.g., Statuses for Price Quotations), and define for each status the corresponding sales opportunity status. • If the Draft status for price quotes is linked to the Open Price Quotation status for sales opportunities, a given sales opportunity will automatically receive the Open Price Quotation status when a price quote is opened for that lead, increasing the opportunity’s odds of closure and estimated value accordingly. • If the Approved status for sales orders is linked to the Success status for sales opportunities, a given sales opportunity will automatically receive the Success status when a sales order is authorized for that lead. Information on this area will follow shortly. Priority also provides a bilateral interface with Microsoft Outlook Calendar, which allows you to synchronize contacts and tasks between Outlook and Priority, and create marketing leads from incoming mail messages. For example, you can record an appointment in the Task Log and use the synchronization program to update it in Outlook. Conversely, data recorded in Outlook during the appointment can later be updated in Priority. If you are working in Priority on Outlook, synchronization of the two systems occurs automatically and continuously. Another important utility in the Marketing and Sales module is the Customer Work Area, into which an unlimited cross-section of customer records can be loaded – by business classification, scope of business (e.g., annual sales volume, number of employees), previous participation in marketing events, position and title of key personnel, and so on. • Assigning a business classification to the entire group of customers currently in the work area, thereby saving the results of the query. These records can then be downloaded into whatever software you employ to aid you in your marketing activities (e.g., Excel to print out lists in spreadsheet format, Word to prepare a mail merge for a mass mailing). Using Priority’s task follow-up utility, you can track marketing-related tasks for a specific lead or customer, including tasks to be performed in the future, and record such information as the customer contact, the employee assigned to the task, results, details, etc. A task may refer to an action performed during the marketing stages of the relationship with a potential customer (e.g., mailing a product description, performing a demonstration, arranging a phone call with the sales manager, faxing a price quotation), or it may refer to an action carried out for an existing customer (e.g., arranging for advanced training, sending a price estimate for a new product, handling a complaint). These marketing tasks can be downloaded from and/or exported to other software applications.